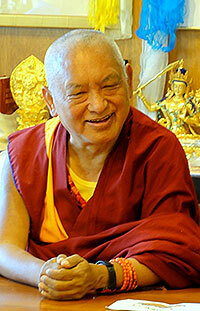 Lama Zopa Rinpoche in Portland, USA, April 2014. New Level for Friends of FPMT! Will Your Center Need an Interpreter? 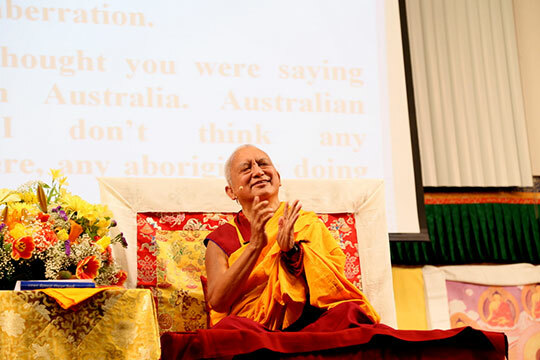 Lama Zopa Rinpoche during the Light of the Path retreat, North Carolina, USA, May 2014. Lama Zopa Rinpoche teaching in front of the simultaneous transcript at the Light of the Path retreat, North Carolina, USA, May 2014. Newsflash: Rinpoche’s teachings during the Light of the Path retreat are available in English, French and Spanish! Lama Zopa Rinpoche during a meeting with the staff of Rinpoche’s office, FPMT International Office, Portland, USA, April 2014. 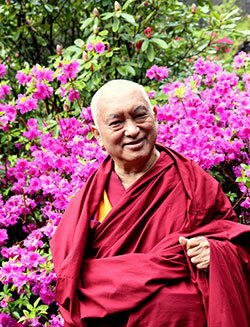 Saka Dawa is less than a month away and the Work a Day for Rinpoche campaign is about to begin! Students from all over the world offer a day (or part of a day) of wages from work each year during Saka Dawa to support Lama Zopa Rinpoche’s work and vision. Join in early! One of Lama Zopa Rinpoche’s vast visions is for FPMT centers to display large thangkas and host festival days where these thangkas can be enjoyed. Please rejoice that quite a few large thangkas have been completed and utilized in this way. We have created a page dedicated to documenting the progress of this vision. If your center has a large thankga not listed, or if you have plans to commission a large thangka in the future, we’d love to hear from you! Amitabha Buddhist Centre, Singapore, share their video of their recent raising of their large Amitabha thangka (31 feet x 50 feet [9.5 meters x 15 meters])! 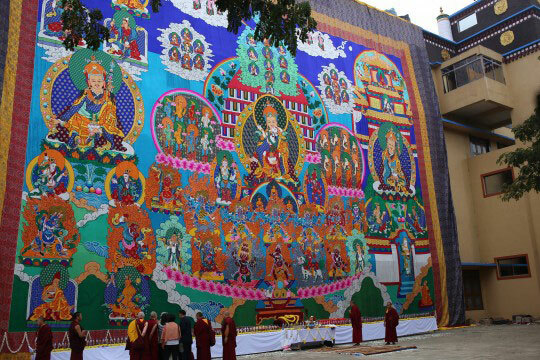 Large thangka of Guru Rinpoche which will be displayed during 1,000 Padmasambhava tsog offerings in India and Nepal and during special occasions. Incense Ritual – a translation of Padmasambhava’s The Divine Blue Water Clearing Away Contamination. The ritual is used to purify contaminations that arise from ignorance, broken commitments, disturbing thoughts and emotions, as well as a variety of other negativities which cause obstacles, illness and misfortunes to oneself, others and the environment. Available in eBook, a4 and letter booklet. Medicine Buddha Jangwa – Freeing the Wretched from the Chasm, a tantric practice to be performed by Sangha or those with Medicine Buddha empowerment, on behalf of those who have recently passed away. Available in eBook, a4 and letter booklet. Buddha Shakyamuni Refuge Field Card – a depiction in tree-form of the Three Jewels and the Lama to aid with visualization. If you shop at Amazon.com, we encourage you to use their “Smile” program to have 0.5% of your purchase price automatically donated to FPMT International Office. Your purchases can then, at no additional cost to you, support the mission and charitable projects of FPMT International Office! NOW is the time to let Sally know if your center needs an interpreter late this year/early 2015; OR whether your center hopes to host a resident geshe in the future and thus has a need for an interpreter trained in a future LRZTP. “In mid-October (only a little over five months away), Lotsawa Rinchen Zangpo Translator Programme Number 6 (LRZTP6) will finish. We will have several NEW INTERPRETERS ready to take up apprenticeships with the resident geshe at your center at the end of 2014! So please consider your interpreter requirements carefully now so that you will not miss out on the incredible opportunity to have a skilled (apprentice) interpreter working in your Dharma center. We currently anticipate that at least FIVE apprentice interpreters will be available for placement in an FPMT center at the end of the course! They all offer English, as well as Dutch, Russian and Hebrew. Three further students are already committed to centers. Contact me now to discuss the possibility of your center booking one of these students now. New arrival! Get a 40% discount on our new colorful Namgyälma mantra, printed on smooth pearlized paper whose unique shimmer accentuates the beauty of the mantra’s original design. 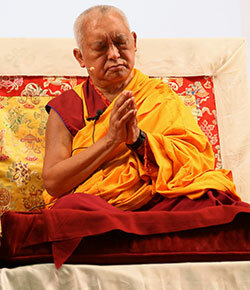 Lama Zopa Rinpoche at Kadampa Center, USA, May 2014. So far, 56 people have booked to participate in CPMT 2014, FPMT’s international meeting, including directors, SPCs, registered teachers, and board members. This year’s meeting takes place at the awe-inspiring Great Stupa of Universal Compassion. Don’t miss this special opportunity – book now! Find further information and the draft agenda. Tushita Meditation Centre, India is looking for a new director; Land of Joy, UK is looking for a spiritual program coordinator; Root Institute, India is urgently looking for a school administrator, a health projects administrator and a maintenance manager.